Powderpost beetles can be found in dead as well as dried and cured lumber. Damage occurs to many wood products such as rafters, joists, flooring, molding, paneling, crating, furniture, antiques, tool handles, gun stocks, fishing poles and baskets. Sometimes homeowners hear rasping or ticking in the wood at night, notice a blistering appearance on the wood, see powdery frass piled below holes in the wood, find numerous round or oval exit holes at the wood surface, and even collect powderpost beetles around windows or lights. Mistakes are sometimes made determining if the infestation is active or non-active. Powderpost beetle is a term used to describe several species of wood-boring insects. Adult Lyctids are flattened, slender, reddish-brown to black, varying from 1/32 to 1/8 inch long. The basal abdominal segment is long, and the antenna bears a club of only two segments. The head is visible from above. Mature larvae are C-shaped, slightly hairy with three pairs of spine-like legs, and yellowish-white with a brown head. The frass is fine flour or talc-like and loosely packed in tunnels. Large quantities often fall out at exit holes and cracks. Lyctids attack only large-pored hardwoods such as oak, ash, hickory and mahogany. They attack “seasoned hardwood” and sapwood timbers found in woodwork molding, window and door frames, plywood, flooring, structural wood, furniture, tool handles and firewood. Pine and soft woods are not normally attacked. 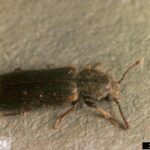 Adult beetles can emerge from wood stored in the home and infest structural wood or furniture. Lyctids rarely infest wood older than five years. Infestations usually result from wood that contained eggs or larvae when placed in the home. The wood could have been improperly dried or stored. Adult exit holes are round and 1/32 to 1/16 inch in diameter. Larvae cause the damage. The key to avoiding serious problems from powderpost beetles is early detection. Homeowners are much more likely to see damage than the beetles themselves. Since tunneling and development of the larvae takes place entirely below the wood surface, the only signs of infestation are the emergence holes made by the adults and the powder-like frass sifting from the holes. Knowing how to differentiate Lyctid from Anobiid beetle damage is more than academic since Anobiids have a broader range of woods that they can potentially infest. Both Lyctid and Anobiids chew small, circular emergence holes in the surface of wood. Holes made by Lyctid beetles are about the diameter of a pinhead whereas exit holes made by Anobiids are slightly larger. One way to differentiate holes of the two species is to insert a “click-type” ballpoint pen into the exit hole; only the tip of the ball will fit through a Lyctid beetle emergence holes. If the hole was made by an Anobiid, the tip of the pen will enter part way up the angled face of the point. Another way to differentiate powderpost beetles is from the consistency of the powder (frass) that sifts out of the exit holes. Lyctid frass is extremely fine and feels like talc when rubbed between the fingers. Anobiid frass is also powder-like, but feels gritty. Infestations sometimes die out on their own accord. Therefore, it is important to be able to determine whether the infestation is active or inactive. Active infestations will usually have powder the color of fresh-cut wood sifting from the exit holes. In contrast to old, abandoned holes, new holes will not have taken on the weathered appearance of the surrounding wood. Powder streaming from recently opened holes may accumulate in small piles beneath the exit holes. If these piles of powder are covered with a film of dust or debris, the damage is old. Careful observation may be required to distinguish new powder from frass that has been dislodged from old larval galleries by vibrations. One final means of confirming that an infestation is active is to mark or seal any existing exit holes. Use crayon or tape over the holes to see if more holes appear. Sweep up all powder, and recheck the wood for new holes and powder at a later date. Since most emergence occurs from April-July, it might be worthwhile to wait until the following spring to determine if new holes and fresh powder are present. This is especially true when attempting to make a determination during the fall or winter months. 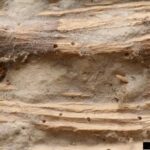 POWDERPOST BEETLES DAMAGE WOOD SLOWLY; thus, homeowners should not feel as though they must act immediately in order to preserve the structural integrity of their home. A “wait and see” approach is often desirable, especially when there is still doubt as to whether the infestation is active. Most powderpost beetles are introduced into homes in lumber or finished wood products (e.g., furniture, paneling or flooring). Lumber which has been improperly stored or dried should not be used, particularly if beetle exit holes are present. Many of the most serious infestations arise from clients who used old lumber from a barn or woodpile behind their house to panel a room or build an addition Powderpost beetles will only lay their eggs on bare, unfinished wood. Wood which is painted, varnished, waxed or similarly sealed is generally safe from attack provided no unfinished surfaces are exposed. Bare wood can be protected from attack by painting or finishing exposed surfaces. Beetles emerging from finished articles such as furniture were usually in the wood before the finish was applied. (Note: beetles emerging from finished wood can, however, reinfest by laying eggs in their own exit holes; sealing the holes prevents this possibility). Powderpost beetles, especially Anobiids, have specific moisture requirements for survival. Since wood moisture levels below 13 percent (during spring and summer) are generally unsuitable for anobiid development/reinfestation, it’s advisable to install a moisture barrier in the crawl space of infested buildings. Covering the soil with four to six mil polyethylene reduces movement of moisture into the substructure and reduces the threat of an infestation spreading upwards into walls and upper portions of the building. Most beetles do not develop in wood with a moisture content below 10 to 15 percent. Another way to lower moisture content in damp crawl spaces is to increase ventilation. This can be accomplished by installing foundation vents (one square foot of vent area per 150 square feet of crawl space). Treating the wood directly with a borate such as BORA-CARE may be an option. Bora-Care is an EPA Registered, low toxicity pesticide designed to penetrate and protect all types of wood, including plywood and composites, from infestations of wood boring insects such as termites, beetles, carpenter ants and decaying fungi. BORA-CARE penetrates throughout the wood and leaves no toxic surface residue. Wood freshly treated with BORA-CARE will appear slightly darker than untreated wood. After a day or so, the treated wood will resume its original color. The BORA-CARE treatment will not affect painting, staining or gluing of the wood. For borates to penetrate wood, the surface must be unfinished. Therefore, joists, sills, rafters, subflooring, studs, decking and siding are all excellent candidates for treatment. Although borates will not penetrate paint or varnish, they will penetrate wood surfaces previously treated with a water-repellent stain (e.g., wood siding, decks, or log homes), provided the water-repellency is broken down by pressure washing prior to treatment. when applying borates or other liquid surface treatments is that the application will only control infestations which are accessible, i.e., wood that is exposed and can be reached for treatment. Infestations which have spread into walls or between floors may be candidates for more drastic measures such as fumigation or wood replacement. If the infestation appears to be localized (e.g., only a few holes in a board or sheet of paneling), simply replacing the board or sheet of paneling may solve the problem. If additional holes begin to appear in adjacent areas, additional action can then be taken. A number of pyrethroid insecticides are labeled for surface treatment of bare, exposed wood. A spot or surface treatment may not provide immediate control of wood-infesting beetle larvae, but should control adult beetles as they emerge and prevent reinfestation by killing first instar larvae before they enter the wood. Killing larvae while still within their tunnels is advantageous, especially where there is concern about further marring of the surface of finished articles with additional emergence holes. Check product labels for specifics. Fumigation is an expensive means of ridding a structure of powderpost beetles and should be considered a last resort. However, in the case of severe, widespread infestations, it may be the only option. Instances where structural fumigations are warranted are when infestations have spread into walls, between floors, and other areas where access/wood removal is impractical. This service is offered by some pest control companies. The best way to avoid such problems is through early detection and implementation of one or more of the corrective actions mentioned above.